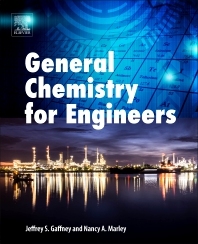 General Chemistry for Engineers explores the key areas of chemistry needed for engineers. This book develops material from the basics to more advanced areas in a systematic fashion. As the material is presented, case studies relevant to engineering are included that demonstrate the strong link between chemistry and the various areas of engineering. Dr. Jeffrey Gaffney is Emeritus Chair and Professor of Chemistry at the University of Arkansas at Little Rock (UALR). Before retiring after 10 years at UALR, he was a senior chemist at three U.S. Department of Energy (DOE) National Labs for 31 years, and was the Lead Scientist for the DOE’s Atmospheric Science Program‘s Megacity Aerosol Experiment – Mexico City (MAX-Mex).Dr. Gaffney has published over 100 peer-reviewed papers, 25 book chapters, and edited two American Chemical Society Symposium volumes in a wide range of the all the basic areas of chemistry, and is internationally known for his work in air and water chemistry and global change research. Dr. Gaffney has taught undergraduate and graduate courses in organic and environmental chemistry and developed a one-semester course for undergraduate engineering students ("General Chemistry for Engineers”). Dr. Nancy Marley is a retired chemist from Argonne National Laboratory after working there for 18 years, and past Research Associate Professor at the Graduate Institute of Technology at the University of Arkansas at Little Rock. Together with Dr. Gaffney she was head mentor of the DOE Global Change Education Program for 15 years. Drs. Marley and Gaffney have been an active research team for over 28 years in the area of atmospheric and environmental chemistry.